The post from Felicity Sidnel about cohousing that I re-blogged recently reminded me of something I read whilst researching the Irish famine of 1845-51. Prior to this traumatic event there existed in parts of the North West of the island a system of communal land occupation and cultivation known as rundale. It had remained unchanged for many centuries¹. It continued even though legal ownership of the land might be vested in a landlord with ties to the British mainland. The people resided in a cluster of homes called a clachan. The adjacent land radiated out from the cluster and was farmed communally. The right to grow crops on individual plots rotated among the members so that each had the opportunity to use the best land. In some such communities plots were re-assigned every 3 or 4 years by the casting of lots. Not that any of the land could be described as ‘good’ by comparison with the fertile soils of the Midlands and South East of the island. It was, however, capable of producing crops of oats and barley or rye, as well as grazing cattle. These uses would be rotated around the plots, the period when a plot was used for grazing providing a chance for the soil to regenerate, assisted by the manure deposited by the animals. 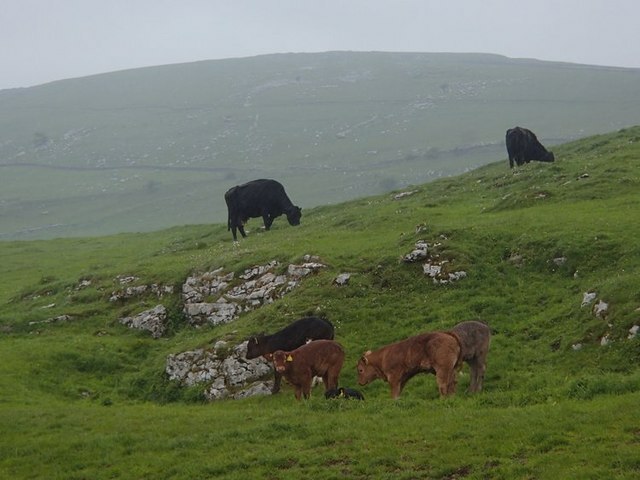 Cattle grazing uplands. © Copyright Andrew Hill and licensed for reuse under this Creative Commons Licence. In many clachan‘s, it was common practice to take the animals to high ground, beyond the cultivated fields, to graze uplands that were incapable of being tilled. In some cases families would have a second, albeit rudimentary, home in the hills for summer occupation by younger members in charge of the herd. In my readings about rundale, I have yet to discover what their diet consisted of in this period. I can imagine they might have taken a supply of oats with them. I think it probable, also, that they would have cooked and eaten edible wild plants such as dandelion and nettle. They may even have caught and cooked small wild animals like rabbits, squirrels and hares. Rundale has some similarities to the system of open field cultivation practiced right across Britain and Europe from medieval times. A key difference is that at the centre of each open field community was the manor house. The rest of the community were subservient to the Lord of the Manor. Otherwise, the rotation of holdings and of crops between plots was the same. The plots, however, took the form of long, narrow, strips. This system continued in some parts of Europe until late in the nineteenth century. In mainland Britain it ended with the enclosure movement which gained popularity with landlords (though not necessarily with the peasantry) throughout the eighteenth century. In the West of Ireland, the arrival of the potato changed this pattern. The potato is a highly nutritious food that is easy to grow on poor soil so long as manure and/or seaweed is available to feed the plants. Such reliance on a single crop was, however, dangerous. There were failures of the crop in some years before 1845. The famines that accompanied such failures were short-lived because potatoes were grown in sufficient quantities the next year. It was repeated failures of the potato crop over a five year period that created the circumstances in which the Great Famine happened. By then, the same pressures that led to the enclosure movement in England were in operation in Ireland also. Rundale was being replaced by the re-allocation of land to single family holdings. It is debatable whether such communal systems of agriculture are more or less efficient than single farm holdings. One factor that is very clear is that community based systems like rundale and the open field system are highly regulated. There may not have been a Lord of the Manor to manage the rotation of crops and the allocation of plots in rundale. There was, however, a hierarchy with a leader known as An Ri, or King. It was this man who supervised the casting of lots and organised such communal tasks as the mending of fences. There is evidence that rundale continued in use in at least one Mayo parish until the end of the twentieth century. The open field system is still practiced in the Nottinghamshire parish of Laxton in England. How do either compare to cohousing as described in Feicity Sidnel’s post? According to the website of the UK Cohousing network “Most cohousing communities have a common house, with shared facilities such as cooking and dining spaces, meeting and playing areas, laundries and guest rooms. Shared outside space for childrens’ play, parties and food growing (my emphasis) can feature in a cohousing project.” This is in addition to individual homes. However, “The community is governed in a non hierarchical way.” But the item goes on to point out that: “Some communities also require residents to undertake a set number of hours work for the community.” Suggesting that a degree of regulation is needed, just as in rundale and the open field system. ¹Not everyone agrees about the origin of rundale. See Yager, Tom. “What Was Rundale and Where Did It Come From?” Béaloideas 70 (2002): 153-86. Web. By franklparker in General posts, Irish History 1845-51 on September 24, 2016 . Thanks for this very interesting article Frank.